The "bridge" following its deconstruction, its internal contradictions and conflicts laid bare. LYON, France -- Post-structuralist civil engineer Jean-Luc Sokal was yesterday blamed for the collapse of a railway bridge in the French city of Lyon, killing over 100 rail passengers. 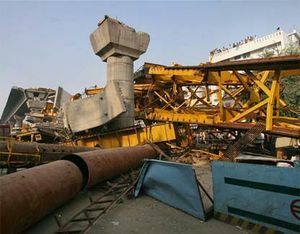 Authorities say that Sokal's attempts to apply the theories of postmodernist philosophers such as Jacques Derrida, Jacques Lacan and Michel Foucault to the process of bridge construction by "deconstructing the binary of stability and instability" were responsible for the disaster. A police spokesperson said that "by removing any objective basis in structuralism it may have had, the bridge was left without any rational basis for supporting itself, and collapsed." Sokal, however, dismissed these criticisms as being "value-laden and essentialist." He said that the "collapse" of the "bridge" was the "event" or "moment" at which "the binary opposition was seen to contradict itself, and undermine its own authority." "In any case," Sokal continued, “deconstruction is not a dismantling of a "structure", but a demonstration that it has already dismantled itself." Sokal went on to argue that the "self" as a single coherent entity with a discernible "will" or "intent" is a fictional construct, so he cannot be held responsible for the "deaths" caused by the bridge's collapse. However, Sokal is expected to face criminal charges on the basis of outdated Enlightenment values. This page was last edited on 5 June 2012, at 04:26.